Europe has asserted itself as being one of the most intelligent political ideas. It has achieved its objectives of peace and stability. It brings our continent unquestionable prosperity. It remains, however, in a state of constant construction. Its enlargement, making it stronger and extending its abilities as a community, are still the source of some major debate which have to be resolved clearly. The Union is moving forwards. 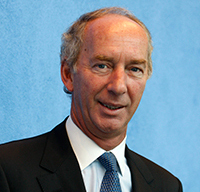 The introduction of the Euro and its deployment to all European citizens along with the entry of new members in the short term rekindle a debate which has been played down a great deal. 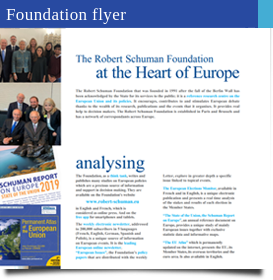 The Robert Schuman Foundation is taking committed part in this, a European-wide deliberation, expressed by the publication of a series of " memos ". The Foundation is to be found within all areas where the future of Europe is being created. Thanks to its network of correspondents it is doing its utmost to support future candidates for membership by going out to meet the citizens of these countries in an effort to help them join. In a modest and yet determined way we can boast a significant enlargement of our range of influence. We are active whilst remaining true to the spirit, ethics and requirements laid down by a truly great Statesman. Our vocation lies in continuity, permanence, the printing of reliable, useful documentation, and also in unrelenting guidance to promote this European plan which, along with others, Robert Schuman found the inspiration for. Find all our Books and other Publications, in printed and/or printable PDF format, in our store! Order directly on line, no need to create an account, it's quick, easy and safe!